KILLINGTON—With this summer right around the corner, Vermont Adaptive announced its new adaptive mountain bike program, one of the first in New England. The program offers limited adaptive mountain bikes plus special dates for outings in various locations. The program quietly began last summer. This year multiple locations, outings and events are planned for all level mountain bikers who have their own equipment. In addition, four adaptive mountain bikes are available for participants on a first-come, reservations-based system. These adjustable bikes are ideal for individuals with spinal cord injuries, amputations or limb differences, or balance and motor skill disabilities. Vermont Adaptive purchased the bikes last summer with funding from the U.S. Department of Veterans’ Affairs grant. Phil Black, owner of the Lookout Tavern, donated monies for Vermont Adaptive to purchase a trailer for hauling the bikes to various locations statewide. “Participants gain a sense of accomplishment when reaching the top of the mountain and that is great to see,” said Kelly Walsh, Vermont Adaptive program coordinator, who is responsible for Vermont Adaptive’s veterans’ programs. For 2017, the U.S. Department of Veterans’ Affairs again awarded Vermont Adaptive grant monies to help purchase 10, two-wheeled mountain bikes and 10 bicycles for use on recreation paths in the area around Central Vermont. These bikes will be added to the existing fleet, allowing participants who don’t need to use an adaptive bike to get outside, exercise and socialize with other veterans, to enjoy Vermont alongside their peers with physical disabilities. The adaptive mountain bike program offers three different types of mountain bikes from ReActive Adaptations: the Nuke, the Bomber and the Stinger. These custom hand cycles are crafted in Crested Butte, Colo. Made specifically for rocky terrain, these unique hand cycles are designed for adaptive riders to cruise down the trails smoothly. For the second year in a row, the High Fives Foundation awarded a grant to Vermont Adaptive in order to provide free open enrollment to the mountain bike program this summer. Although Vermont Adaptive will have a limited number of adaptive mountain bikes for use, all adaptive riders are encouraged to bring their own bikes and participate in any of the summer events. Reservations are required for programming and equipment use. The summer will kick off with the Summer Solstice Bike Ride June 21 at Blueberry Lake in Warren, followed by the seventh annual Long Trail Century Ride to benefit Vermont Adaptive’s mountain bike “Snowshed Session” June 24 at Killington Resort. Next up are the Green Mountain Trails Bike Ride July 9 in Pittsfield, the Blueberry Lake Bike Ride July 9 in Warren, the Vermont Mountain Bike Association Festival July 21-23 in Warren, the Killington Bike Ride July 29 in Killington, and the Pine Hill Park Bike Ride Aug. 13 in Rutland. This year’s Killington Resort Adaptive Event for Independent Riders will also have bike demos “encouraging adaptive awareness for proper use of hand cycles,” said Olivia Joseph, Vermont Adaptive program coordinator and organizer of the adaptive mountain bike program. The program is looking for volunteers who have an interest in mountain biking. For more information or to become a volunteer, contact Olivia Joseph at north@vermontadaptive.org. Rider demonstrates new adaptive bikes. 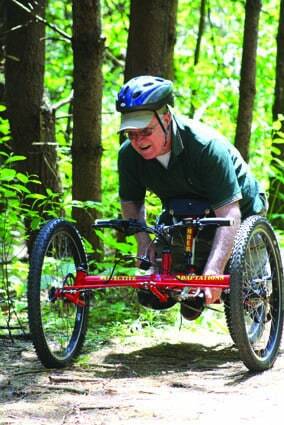 Vermont Adaptive plans to participate in trail rides throughout the state.